The long distance bus service from Jatrabari and Sayedabad terminals in the capital have started on Tuesday afternoon after the transport workers withdrew their strike. Confirming the matter, Nurul Isalm, DMP Deputy Commissioner (South) said the reporters that police sat in meeting with leaders of Dhaka District Sramik Union and Bangladesh Sramik Union and they withdrew their strike. 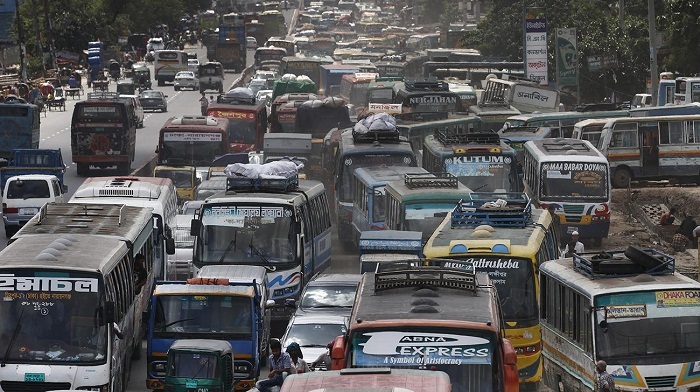 Before 5:00pm this afternoon bus service of Chittagong-Sylhet routes became normal, he added. Abdur Rahman, an executive member of Bangladesh Sramik Union, said the both group reached an agreement and we suspended the strike. Bangladesh Sramik Union and Dhaka District Sramik Union, two rival groups clashed over occupation of an office in the locality yesterday. Bus owners and transport workers suspended buses from 6:00am today. They placed buses after the clash on Hanif flyover in Jatrabari and halted for about half-an-hour.